Fly anglers searching for good carp fishing don’t need to look too far to find a pond, river or reservoir where these fish are abundant. Carp are proving for many anglers to be unexpectedly challenging, although for the anglers that “crack the code,” fishing for these big fish becomes addictive. 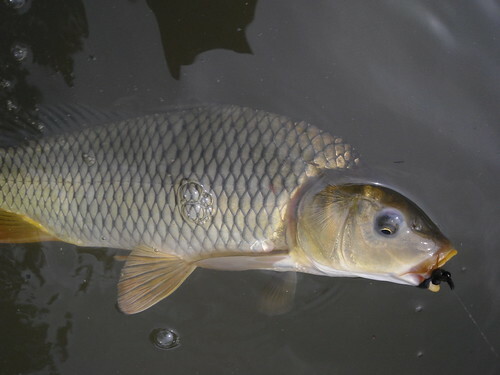 Anglers who try carp fishing in a variety of waters will discover that carp will chase and eat flies, take flies off the surface, and even tail in shallow water. The carp above followed the fly in clear water, watched it sink to the bottom, and refused it. A small twitch changed the fish’s demeanor and it pounced on a simple dumbbell eye fox fur pattern. This is one area I like to fish that has tight cover, clear water and fish that will swim three feet to eat a fly. Another spot has wide open spaces for casting, sandy bottom and carp that will even rise to the surface, yet they are ultra selective. My favorite place is a secluded, muddy pond loaded with the biggest carp I’ve seen locally. The interesting thing about this pond is the carp are always actively tailing. Carp “mudding” on the bottom are not uncommon, but tailing carp offer a clear sign of where a fish is actively feeding. Anglers need a certain degree of visibility to know where to present a fly to a carp, and there is no better cue than a big tail waving around on the surface. Recently I waded out into the pond with my camera to film what anglers would more likely expect to see on a redfish or bonefishing trip. I’d get into position, wait for a tail to tell me where to cast, and drop the fly in front of the fish. There was zero margin for error, too far and the fish doesn’t see the fly in the muddy water. If the cast lands too close, or if the carp feels the line or fly stripped against its body, the fish spooks. If the cast was good, I’d give a long, slow strip to draw the carp’s attention and watch the tail for a reaction. A flip of the tail and subsequent boil was a clear indication the carp picked up the fly. In two hours I hooked six fish, all of which went ballistic once hooked and completely thwarted my efforts to land them. Two of the fish actually jumped, breaking my line and the others wrapped me up in debris. The majority of these fish were well over twelve pounds, so long battles and getting into the backing was common. It was easy to tell the big carp from the smaller ones, just by the size of the tail. Nearly halfway into the video I zoom in on a huge tail belonging to a carp I dubbed “The Manatee” for obvious reasons. In the latest video I filmed three minutes of tailing carp in a small pond in Maryland. This entry was posted in fishing report, video on June 5, 2010 by Jason du Pont.